Originally published under the title "A Return To Bush-Era Foreign Policy – Prez Candidate Kasich Regrets Turkey Not Being In The European Union." Ohio Governor Kasich thinks the EU should have let in Turkey. One of the overlooked moments (and understandably so) of last night's Republican candidate debate was the moment Gov. 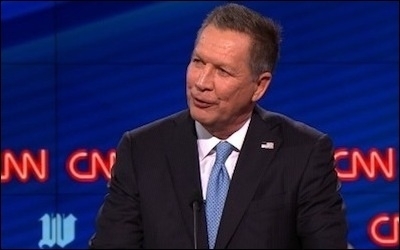 John Kasich told the audience that he would have liked to see Turkey joining the European Union (EU). Gov. Kasich, who has the hardest "path to victory" for his party's nomination, but perhaps the easiest path to a Vice Presidential pick said last night: "We're going to have in some way or another rapprochement with Turkey. And I frankly think that the Europeans went in the wrong direction when they rejected Turkey from joining into the economic sphere of Europe." Let's be clear: the "economic sphere of Europe" is the European Union. Gov. Kasich couldn't have meant anything else, since European Economic Area (EEA) membership is now nothing but a precursor to EU membership, and since the Lisbon Treaty (the EU's constitution) makes it incumbent on the union to "develop a special relationship with neighbouring countries, aiming to establish an area of prosperity and good neighbourliness." By the latter definition, Turkey is already in Europe's "economic sphere." 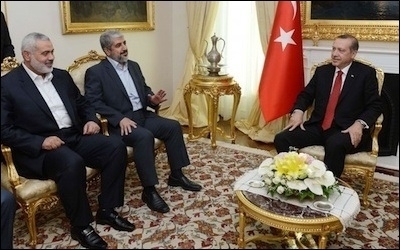 Turkish President Recep Tayyip Erdogan (right) with Hamas leaders Khaled Mashaal (center) and Ismail Haniyeh in June 2013. Far from being a country with "European values" at its core (let's avoid the spurious catch-all term for a minute and take the EU's word for what it stands for), Turkey has slid into being an authoritarian, Islamist state that has almost nothing in common with other EU member states. I've written about it at length here, with a specific focus on how Turkey is emboldening ISIS, aiding human traffickers, blackmailing EU member states, targeting its Kurdish population, and jailing journalists. This is only scratching the surface of where the country is headed – and Gov. Kasich wants to "reward" them for this by getting them EU membership? (Yes, EU membership is good for some countries, but not for Britain – there's no hypocrisy there, I assure you). In 1985, President Ronald Reagan gave a speech about the hijacking of TWA Flight 847 by members of Hezbollah and Islamic Jihad, where he said: "America will never make concessions to terrorists – to do so would only invite more terrorism – nor will we ask nor pressure any other government to do so. Once we head down that path there would be no end to it, no end to the suffering of innocent people, no end to the bloody ransom all civilized nations must pay." Turkey is clearly using Europe's migrant crisis to flood the continent with people that is does not want. This, to me, is economic and cultural terrorism. 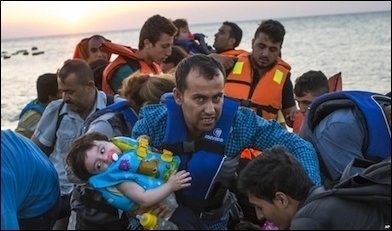 Turkey has facilitated the recent wave of mass migration from the Middle East into Europe. My sources in the European security institutions were clear about how the country is turning a blind eye to the human trafficking which is helping people across the Mediterranean, or indeed helping people to die. For Turkey, it's a great opportunity to export Kurdish problems into Europe. And export they have. We now see Kurd vs. Turk battles in Stockholm, Frankfurt, and even Wales. And now they're demanding visa liberalisation for the country's 75 million strong population, as well as €6bn ($6.7bn) and a fast tracking of its EU accession process. At the start of this year I predicted this would happen – though I did say that at the end of it all, EU leaders would balk and keep Turkey out. God I hope I'm right. Bottom line: Turkey is terrorising the EU and we appear to be happy to negotiate. Even if you're a massive believer in the EU, there's no point in a European Union that is basically trying to engulf the entirety of the non-U.S., non-China, non-Russian world. But that's what it is beginning to look like. With the latest moves to engulf Georgia, further expanding the EU's borders, and further antagonising Russia, the organisation is beginning to look a lot less like a European Union, and more like a Eurasian Union. No doubt there are a lot of Brussels bureaucrats for whom the idea of a 'Eurasia', from Portugal to the Behring State (per Orwell's 1984) is the ultimate goal – neo-Bolshevism and all. But this isn't on the cards just yet. Let's play the hand we're dealt. Ninety-seven per cent of Turkey's land mass is in Asia. And barring a few metropolitan, touristy areas, there's very little "European" about the country. Of course the phrase "European" is almost meaningless nowadays, thanks to the EU. But I'm using it in a traditional sense. Turkey may have been a convenient NATO member state until it showed itself to be heinously irresponsible vis-à-vis Russia, but that doesn't make it "European." As the "Debating Europe" website puts it: "Agreeing to one non-European member would open the door for candidates from Cape Verde to Kazakhstan. Turkey is too big for the EU to absorb. With a population predicted to reach 91 million by 2050, it will be the dominant member of the EU." Gov. Kasich must surely know how the European Union works, with Germany contributing the largest share of bloc's budget, though maintaining one of the lowest contributions as a percentage of its economy. As such, Germany basically calls the shots in the union, as we've seen over the past year with the migrant crisis especially. Frau Merkel has caused the effective collapse of the Dublin Treaty, the Schengen zone, and even undermined Germany's own constitution in exchange for a low-wage population boom. But where's the comeuppance? Where's the accountability? There isn't any. Germany's population is around 81 million. Turkey's is around 75 million. Accepting the latter into the EU would make Turkey the second largest nation by population in the EU. Overnight, the power dynamic of the EU would change, with around 90 Turkish members of the European Parliament being elected to Brussels/Strasbourg. No wonder Mrs. Merkel and Mr. Erdogan seem so close. And this is a German-Turkish union that Gov. Kasich wants, and that Prime Minister David Cameron wants us to stay in? Mass migration? You ain't seen nothing yet. Often we hear about the 1.5 million that came into Europe last year, or the eight million that some are now predicting over the next few years – that these numbers are piddling compared to the continent's half a billion population. This makes the faulty assumption that millions of people are spreading themselves out evenly across Europe – or that European institutions were prepared for this influx in the first place. And these are just the logistical, not cultural arguments. When visa liberalisation with Turkey comes to pass, you can expect another influx, potentially of millions, from Turkey. People looking for jobs – economic migrants – who are coming from a country where the average salaries are only higher than Bulgaria, Romania, and perhaps Hungary in terms of EU member states. Turkey is an authoritarian Islamist state sharing almost nothing in common with EU member states. We saw what happened when Romania and Bulgaria were given access to the United Kingdom. Despite what the BBC and the Guardian wanted to find, the number of people applying for National Insurance contributions, for work, in the United Kingdom, soared to nearly a quarter of a million in one year. Turkey's membership of the EU would create yet another wave of cheap migrant labour into Europe, further suppressing wages, and placing more pressure on the welfare states across the continent, not to mention local communities, their cultural aspects, and their identities. Gov. Kasich wouldn't get away with calling for a country like Turkey to join the North American Free Trade Organisation. Nor should he get away with calling for a country like Turkey to join with the United States in any Trans-Pacific Partnership (TPP) or Trans-Atlantic Trade and Investment Partnership (TTIP) deal. But for some reason this potential future Vice President of the United States is happy to place the Turkish burden on the shoulders of the average European – to shore up his foreign policy idealism. I thought we had had enough of Bush-era foreign policy?